The Oz Mix: David Bowie - A Conscious Death? David Bowie - A Conscious Death? was his 'parting gift.' His parting gift appears to contain multiple perspectives on death by an experienced traveler who is almost there. The album's name is a symbol, it's not a word or words; Bowie's gone beyond words, died to words representing his art before he died in body. It looks like a black star so everyone is calling it Blackstar, but that isn't its name, it's a representation of its name: a graphic symbol. The symbol communicates infinitely more than its representation and can even become a doorway for adventurous astral experimenters. I'm going to refer to it as Blackstar because I can't make the above graphic smaller. The only other album I know of named with symbols in place of words is Led Zeppelin's fourth studio release also intended for magical purposes. Both David Bowie and Jimmy Page have been quite open about drinking from the same source, Aleister Crowley. On Hunky Dory Bowie sings: "I'm closer to the Golden Dawn immersed in Crowley's uniform of imagery." I see speculation about the possible meaning of Blackstar online so I'll chime in. It was commissioned for the TV series the The Last Panthers so I wonder if he might have been mentally associating with the Black Panthers when he came up with Blackstar?? He might have also encountered the descriptive phrase, 'black star,' during cancer treatment as a term health care professionals use for one visual effect of breast cancer. Magically speaking, the black star is a pentagram. One of the initial formulas you come across in the Golden Dawn literature is: pentagram = hexagram, represented as 5 = 6. It symbolizes the transformation of man into godhead - the next level, however you wish to consider it. In the Blackstar image above, below the five-pointed star we see six star fragments. 5 = 6. 5, the pentagram, the star, symbolizes the balanced WoMan; each of the four lower points connects with one of the four elements, one of the four lower circuits with the top point being the element called spirit . To me, the most basic meaning of Blackstar: black = death, an obvious correspondence, and star = man as per the G.'. D.'. formula. When Bowie sings "I'm a blackstar," it translates as, "I'm a dead man," and he didn't want people to hear it until his life/death became that art i.e. Blackstar. If he did follow the G.'. D.'. formula then the star also corresponds with the 6 part of the formula. The 5 becomes an equivalence to 6 when the 5 becomes a star, when the lower circuits (physical, emotional, intellectual, social) get balanced, function harmoniously and become crowned by spirit. Then black = death while star = 6 = godhead, the next step, etc. Singing "I'm a blackstar," then seems like he's saying "I'm dead, but I've moved on." The six star fragments below the main star could symbolize that WoMan has to be taken apart to reach the next level. Death seems necessary for the real transformation. Bowie's artistic personae transformed often and radically over the years. He knew how to die before he died. Another song on Blackstar is Lazarus, also the name of an off-Broadway musical Bowie wrote the music for. It's a sequel to the film he starred in, The Man Who Fell To Earth. The opening for it last December was his last public appearance. Lazarus. Eno said. “I received an email from him seven days ago. It was as funny as always, and as surreal, looping through word games and allusions and all the usual stuff we did. Over the last few years - with him living in New York and me in London - our connection was by email. We signed off with invented names: some of his were Mr Showbiz, Milton Keynes, Rhoda Borrocks and the Duke of Ear. [This time] it ended with this sentence: ‘Thank you for our good times, Brian. They will never rot’. And it was signed ‘Dawn’. I realise now he was saying goodbye." The only other individual I can think of to attempt to make his death a work of art, an educational gift to humanity, was Timothy Leary. As soon as Leary found out he was terminal he wrote an outline for his last book called Design for Dying which came out posthumously, completed by R.U. Sirius. On the jacket it says: "Leary ... used his approaching death to create an exuberant new vision of what dying can be. Optimism, courage, joy and spirituality were central to Leary's final days and his death. Design for Dying ... shows us how we too can make dying the high point of life." This is a promo photo released with Blackstar. David Bowie, the star, dressed in black showing optimism, courage, joy and spirituality. Leary had two separate documentaries made of his final days and death. In one of them it appears that Leary's head gets surgically removed from his body in order to cryogenically preserve it. There's a riveting image at the end of someone carrying Leary's head on a platter underneath a glass case . A similar image with a different head turns up in the video for Blackstar. That head is the skull of an astronaut ( Major Tom?) subtly stylized and decorated with gemstones. At the end of the video it gets used in what appears like some sort of magick ritual. Both Leary and Bowie displayed adept qualities at qabala so it doesn't seem surprising they would use it in their final communications. The combination of "head" and "death" conveys a significant key for surviving death, a motif these two pioneers of dying consciously and elegantly portrayed in their final video images. Blackstar becomes cognate with that motif. Blackstar conveys a key to dying consciously. Leary did have incredible optimism which he applied to dying. At the beginning of the Blackstar video we observe a common symbol of optimism, often a trite cliche even, but reterritorialized with poignant affect in the context of this video and of death. The following is reprinted from RawIllumination.net. It consists of comments I made regarding David Bowie, Robert Anton Wilson (RAW) and yours truly. I recall someone in the online Crowley course RAW gave posting a rumor or anecdote that David Bowie had been seen at a RAW talk in the LA area in the early to mid '70's. I never did discover the actuality of that, but it seems plausible. Bowie lived in LA at that time and traversed similar experimental territory with RAW. They both practiced qabala and magick and both used it in their artistic expression. Bowie also appeared completely dialed in to the space migration, extra-terrestrial intelligence, Starseed Transmissions gestalt that RAW and Leary were promoting in the '70s. Starting with his first popular single, "Space Oddity," which under the right circumstances really does give the feeling of being way out in Space, then especially on the album "Ziggy Stardust and the Spiders from Mars." "Space Oddity" was released in the summer of 1969 to coincide with the launch of Apollo 11 while Ziggy Stardust was released in 1972 so it seems unlikely that Bowie picked up the E.T. Intelligence subject from RAW and Leary who were undergoing their own experiences around that time and had yet to publish their findings. I don't know how or where Bowie picked up on that meme. He could have, through his experiences with experimental theater and magick, gotten himself hardwired to the source — whatever transmission it was that gave RAW the impression he was in communication with some kind of Intelligence from the Sirius star system. Through his studies of Crowley, Bowie could have been in touch with the ideas put forth by Kenneth Grant who also had theories and inferences regarding extraterrestrials and Sirius. In 1975 Bowie filmed The "Man Who Fell To Earth" his first major role and he played an extraterrestrial. I felt there was much useful information, mood and atmosphere related to E.T. contact in there I remember leaving the theater elated to see the film end with an allusion to an occult symbol when Bowie tips his hat. Bowie's music became the primary soundtrack and inspiration to whatever Sirius contact experiences I had in the early 80's. One of the weirdest synchronicities involved the song "Starman." It was the first song on side B of a Ziggy Stardust cassette I had. One day I rewound the tape, turned up the volume and began a yoga practice. The next song was surprisingly not from Ziggy Stardust, not David Bowie at all. I went to check the music machine and saw that I hadn't been playing the cassette at all. When I turned up the volume I was turning up the radio which just happened to start that song at exactly the same time. Bowie was the lead musical figure and guiding inspiration, particularly his Berlin albums with Fripp, Belew, and Eno, to the punk/post punk art scene circles I moved in. A friend was in love with him so in 1980 she flew to New York and got tickets to see him on Broadway in "The Elephant Man." She told the theater manager her story and asked if there was any way she could see him only to be rewarded with a 40 minute private meeting in his dressing room after the show. She said he was very polite; they casually chatted about ordinary things. In 1983 Bowie hit town with his Serious Moonlight tour. One of my top concert experiences, he definitely fulfilled the role of cosmic prophet/musical hierophant, a disseminator of Higher Intelligence. Through the set design, costumes and, of course, the music he projected a vision of global awareness and peaceful, tolerant, cooperative, diversity. One of the props was a large blue beach ball of planet Earth that they bounced around playing like they were gods. Truly a genius. Truly awesome elucidation of a tremendous artistic triumph of the highest order. First thing I thought of with all this was Leary's Design for Dying, and appreciating what a graceful and profound exit he made. 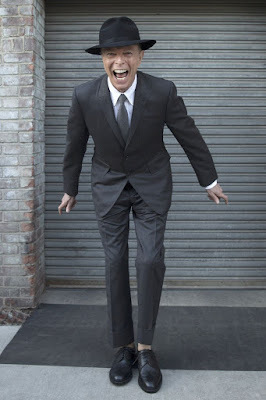 I never really got pulled into Bowie's orbit before, just as a matter of circumstance, but the perfectly orchestrated timing of the blackstar videos, et al, have got me tuned in to his wonderfully accomplished GREAT WORK :) Thanks for helping spell out the context for the newly initiated! Oz, Bowie ALWAYS released his albums on his birthday. Check back. where do you see that? I'm looking at all of his albums' release dates and Blackstar is the only one released on his birthday...? Nice acknowledgement of an artistic genius who was still in touch enough with the planet to make an essential communication that has reverberations through generations.